Summer box office finally gets to the fireworks factory with the Memorial Day weekend. This week's new releases include two of the films expected to be the biggest of the year, going head to head in what could be a record setting weekend. 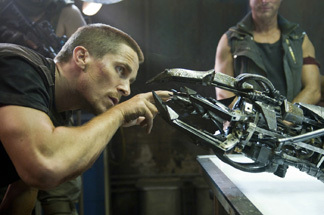 Getting a jump on the weekend is Terminator Salvation, the fourth film featuring robots trying to kill John Connor. Starting with midnight Wednesday screenings and a full day of shows on Thursday, it's going for a five-day opening weekend that's undoubtedly been calculated to ensure it the number one spot on the weekend, versus Night at the Museum: Battle of the Smithsonian. I don't think it quite needs it, but they've decided to stack the deck, I suppose. T4 jumps past the angst of trying to prevent the near-annihilation of the human race in Judgment Day by leap-frogging over it into the war against the Machines, led by an adult John Connor. As his ever-dwindling band of resisters tries to break through against the seemingly unstoppable Skynet, a new threat emerges – Skynet is taking human prisoners and replicating? cloning? breeding? humans for some nefarious purpose, to the point that its products actually believe they're human. Adjacent to and tangential to this plot, things blow up, which if you're honest, is why you really want to see this movie. Christian Bale takes some time out from being Batman to stake his claim on yet another movie franchise (this, the first of a potential new trilogy set in the future), playing Connor, and is joined by fellow resisters Bryce Dallas Howard, Anton Yelchin, Helena Bonham Carer, Moon Bloodgood and the... well, we don't quite know what he is just yet Sam Worthington. After the relative anonymous direction of Jonathan Mostow for T3, the reins are passed, somewhat troublingly, to McG, he of Charlie's Angels and The O.C. Not a guy known for substance in his films, he'll at least make it look pretty.